Admiral John Paul Jones in Life. Photo from Wikipedia. 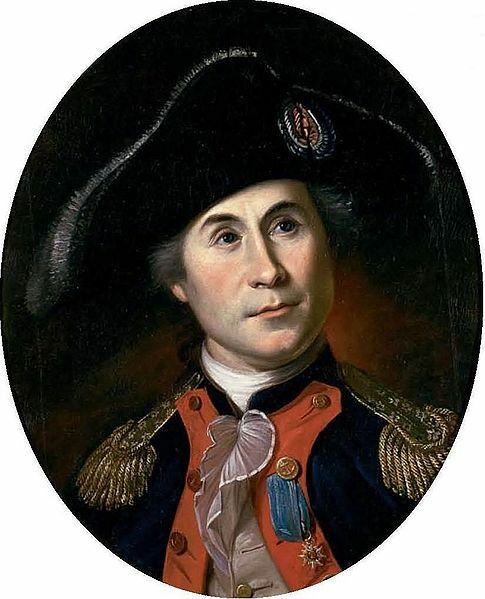 Admiral John Paul Jones (1747-1792) was a legendary seaman and war hero who fought valiantly in the American Revolution. Jones was a Scottish sailor who commanded a ship in the Continental Navy during the Revolution and is considered a founder of the United States Navy. He inflicted significant damage to the British along the coast of Nova Scotia, and led raids on the British forces along the coasts of Ireland and England. On July 18, 1792 John Paul Jones died in his Paris apartment. Gouverneur Morris, the American ambassador to France at the time, had an intense dislike for Jones and refused to pay for a proper burial. Luckily Jones had an admirer in Pierrot Francois Simmoneau, who donated the money for his funeral expenses. Because of his Scottish Calvinist background Jones was buried in the Protestant section of the Saint Louis Cemetery. Jones’s body was preserved in alcohol and interred in a lead coffin, which was in turn placed in a wooden coffin, so that his body would be easily identifiable when the United States got around to claiming his remains. But four years after Jones’ death, France’s revolutionary government sold the cemetery property and all of the bodies buried there were forgotten. The team discovered the site of Saint Louis Cemetery’s Protestant section and unearthed Jones’ lead coffin in 1905. On April 7, 1905, the Jones’ remains were positively identified during a post-mortem examination. The research team determined that the mummified body belonged to a man who was between 40 and 50 years old, and was about 5’7″ inches tall, all of which was consistent with Jones at the time of his death. The body was clothed in a linen shirt, and his long brown hair, about 30 inches long, was covered in a linen cap that was monogrammed with the letters “J” and “P.” Jones’s body was immediately transported back to the U.S. aboard the USS Brooklyn. On April 24, 1906, Jones’s coffin was installed at the United States Naval Academy in Annapolis, Maryland. During the ceremony President Theodore Roosevelt gave the eulogy. On January 26, 1913, the Admiral’s remains were re-interred in an ornate bronze and marble sarcophagus in the Naval Academy Chapel.